My iphone and instagram have been playing a big part in my project life layouts lately. It's so convenient to use my iphone camera because it's always with me and the quality is great. 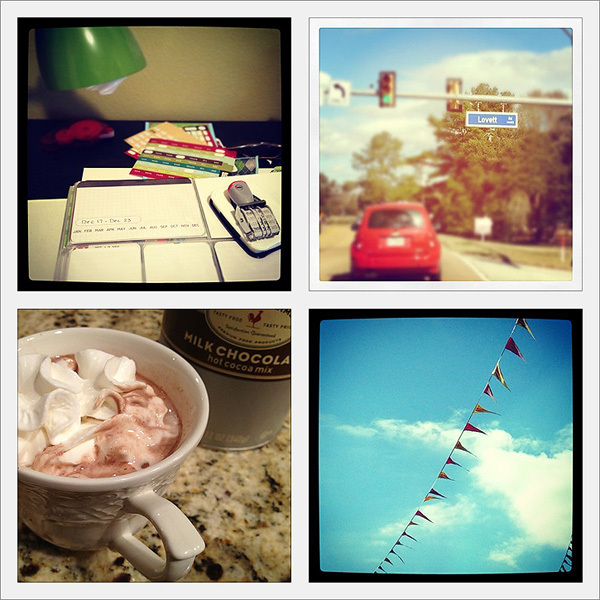 I love the selection of instagram filters and I'm including them in my project life pages pretty much every week now. I print at home with an Epson Artison 837. 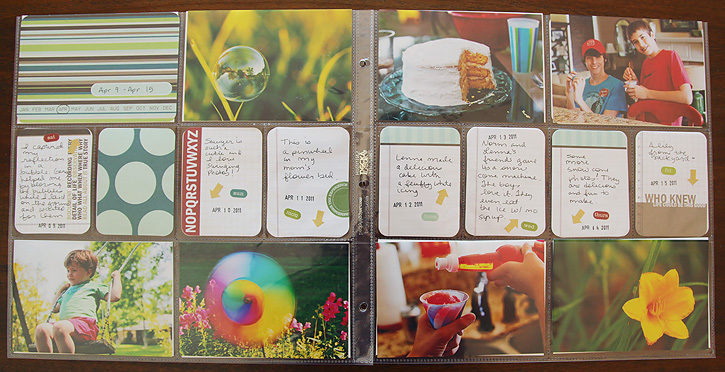 I use Epson Ultra Premium Photo Paper in glossy to print my photos and Epson Ultra Premium Presentation Paper in matte to print journal cards and other printables. Whether you print online or at home, you can use photoshop to prepare your instagram photos for printing two at a time on a 4x6 photo. I made a video to show you how I do it. **If you print online, just save the file as a jpeg and include it when you order your other 4x6 photos. If you don't have photoshop, no problem! Did you know there's an app that will print your instagram photos for you? So you don't even have to transfer them to your computer and then upload them to a printing site. It's called postal pix. 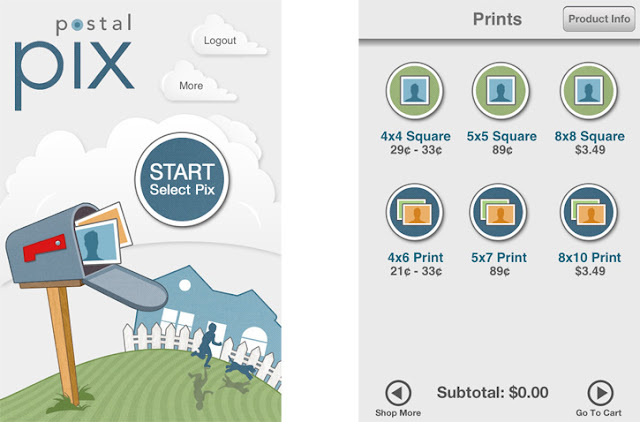 You can order square prints in 4x4, 5x5 or 8x8. Here are screenshots of the main page and the product info page. 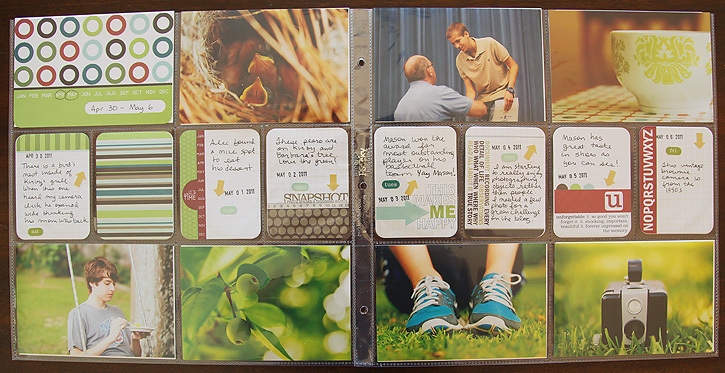 They don't offer a smaller option than 4x4 so you just need to make a collage with four instagram photos using a photo collage app if you want to print them to fit in the journal card slots. It's very easy! There are a lot of collage apps out there, but the one I use is called frametastic and I think it's free right now. I made this collage with four photos and then ordered it as a 4x4, resulting in four 2"x2" photos. Or you could order the 5x5 size if you want them a little bigger. Here's a peek at the prints I ordered from postal pix. They turned out nice and arrived in a week. These are a few layouts from the end of 2011 that used instagram photos. I sized the one in the top right a little bigger at just under 4" since I only had one to share for that day. This was before I decided I like the photos printed at 2.25" so the two square photos on the above layout were printed at 2.75". Remember, you don't have to stress about adding extra embellishments or different size photos if you don't want to! 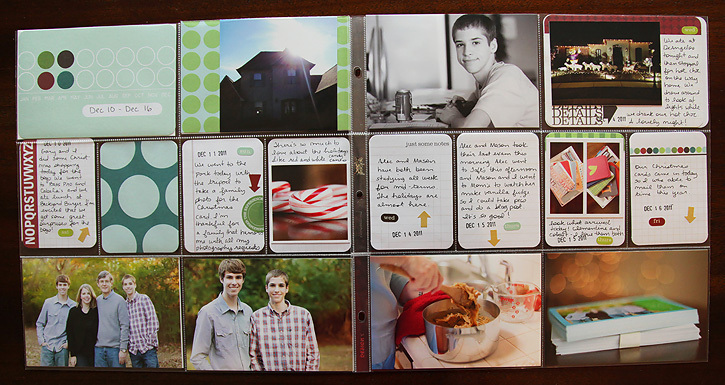 The project life layouts look great and they are a treasure for your family no matter how you put them together. 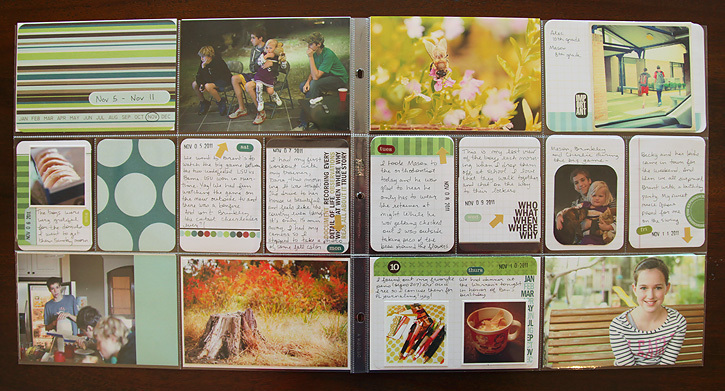 I love the simple pages too... the important thing is to get your memories documented. I love your pages and since I just started using instagram on my ipad, the tutorial is very helpful. Still not sure what I'm going to do about project life this year. I got my order together on Amazon yesterday and discovered the page protectors I wanted were unavailable. I'm thinking I liked it better when they sold everything as one big kit rather than having to piece it all together. But I can continue to be inspired by your project! love the pages. Can't wait to get started on my first week today. I still have catch up on 2011 to do but I will work on that while staying current this year. I love this! It really makes me want to get an Iphone. You are right, memories need to be documented! I am sure you will be thrilled to go through this book in a few years. I love seeing your pages all put together! I can't wait to start mine. I don't have an iPhone or Instagram - just a Tracfone, but I can take pics with it, so I will keep the resizing in mind as I'm not sure how well they would look as a 4x6. I love having options! I love how you are doing your pages Deb -just wonderful! Thank you for sharing all these wonderful tips. You project is coming together just fantastic. I love seeing your layouts and how you incorporate extra photos! I am using phone pics and it is fun to actually print them... Don't usually do that! Wow, you are actually printing up your photos. I don't do that often. You are inspiring me. This might be a silly question, but is there a way to add a white frame border around the photos in PhotoShop? jessbrees: I tried to email you to answer you question, but you don't have a return address with your blogger profile and your blogger profile is private. Anyway, of course that isn't a silly question! There are actually many different ways to create a white border. You can use the fx button below the layers palette and choose stroke or you can crop it until it's larger than the size of the original photo and then fill with white using the paint bucket. Feel free to email me if this doesn't make sense and also I'll let you know how to make sure your email is included with comments so your questions can be answered directly to you! Deb, what a wonderful tutorial...I'm inspired to get a new printer, so I can start printing some of my photos. Your pages look nice! Man I wish I had an iPhone! when printing with postal pix is the date you took the picture printed on the back? I have been uploading to shutterfly because of that feature. but I'd love to go right from my phone with postal pix instead of using the computer! wow! what a brilliant tutorial, deb! Thanks so much for sharing this will us. This was a superb tutorial - and I learned alot. I appreciate you taking the time to teach and inspire me/us. These are sooo great. I love them. Thanks for sharing the tips. Hi Deb, I have a quiestion. Since I'm new to Instagram...how do you get the pictures out of the app? Do you take a photo of the Instagram photo after altered? or how can I do that? Wilda, When you hook up your iphone to your computer, you can transfer the photos just as you would from a camera or sd card. Or you can email the photos to yourself. The other option is iCloud which is what I use, but I'm not sure how that works if you're not a mac user. 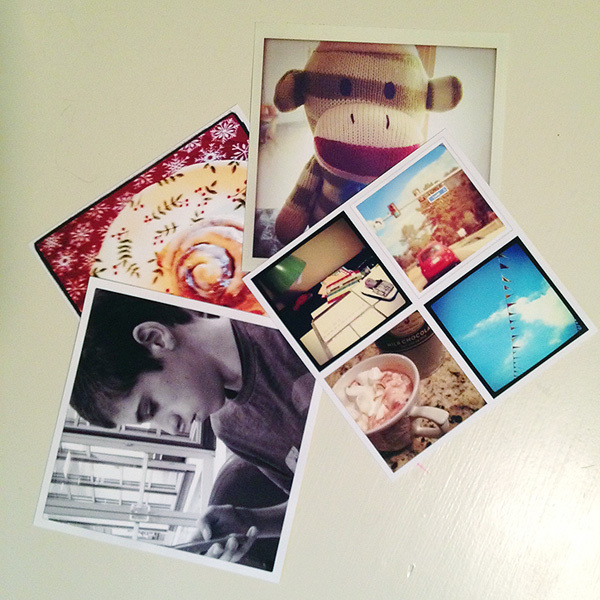 I like printing my instagram photos with postal pix too! I was wondering if you knew where I could find 4X6 "backing" cards? I guess I could cut my 12x12 paper down but I thought there might be cute tags or something out there? Awesome tutorial!!! Thanks so much! It wouldn't print directly out of PS for me but I just saved as a jpeg and printed out of preview. Thanks again!! Thanks for the tutorial, I learned alot! I searched postal pix in my app store and it's not coming up anime else experiencing this? Oh, this is really neat and quite inspiring me to do mine too. I've been meaning to do it but I just lack pushing and inspiration. I will have to start gathering my photos and see what I can start up with. Thanks for sharing. Come by and enter my current giveaway for a chance to buy instagram followers cheap ebay win a stunning mural wallpaper(worth up to $500! )if you like, Sundeep! Thanks for sharing. Have you ever heard of Snapstagram? They offer the easiest (and probably cheapest) way to print instagram photos. They offer free shipping on all instagram prints too! Company greeting cards are the ideal medium for you to set off any conversation along with new clients, Plastic card printing vendors, colleagues and also other linked celebrations. Those who don't have business greeting cards neglect to make the correct perception as well as possibility to reduce your customer is pretty higher. very interesting and fun website. I have really learned so much from this awesome website. This is really great.